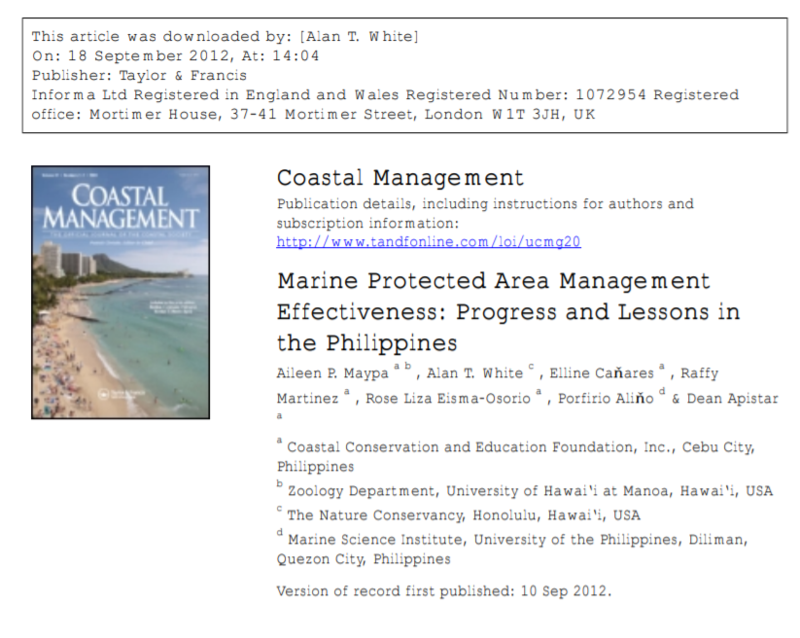 Abstract Quantifying progress in management of marine protected areas (MPAs) is crucial to marine conservation and fisheries management in the Philippines. This study compiles data on the status, occurrence, and management gaps of MPAs through coordination with multiple organizations supporting and guiding MPAs in the Philippines. MPA management effectiveness was measured using a MPA Rating System. Since 2002 the modal MPA rating levels increased from level 1 (initiated) to level 4 (sustained) in 2008/9. This upward trend is attributed to factors that promoted both the establishment and improved management of MPAs. Analysis indicated that: (1) most MPAs struggle with budgetary constraints or lack of sustainable financing and (2) overall the MPAs are being maintained and progressing with notable improvement in management despite a range of difficulties encountered during the implementation process. For MPAs in the Visayan Region for which biophysical data were available, the MPA Rating System was used to assess the effectiveness of local government capacity building on MPA coral reef health. Our results suggest that MPAs with higher ratings are likely to have better reef health conditions.